Prompted by the first episode of Clarkson, May and Hammond’s Grand Tour, last November we wrote a feature on the Ferrari LaFerrari, McLaren P1 and Porsche 918 Spyder, aka The Holy Trinity. And that got us thinking about similar Holy Trinities of yesteryear. For example, contenders for a Holy Trinity of the 1930s might be an Alfa Romeo 8C, a Bugatti Type 57SC and a Mercedes 500K. A 1950s trinity could well be the Ferrari 250GT Tour de France, Jaguar XK-SS and Mercedes 300SL, while the Porsche 959, Ferrari F40 and McLaren F1 would obviously all figure in trinities of the ‘80s and ‘90s. But let’s start with the 1960s – a decade so rich in divine driving machines that we could have compiled several other trinities. The three ‘limited-edition’ GT cars we’ve chosen were all conceived and built at a similar time and with very similar purpose, although that purpose was rather different from the purpose of most of today’s low-volume trinity contenders. Imagine an Aston Martin One-77, or better still, a road-legal Vulcan half a century ago, and you’ll have some idea as to the desirability and status of a DB4 GT Zagato back in the day. 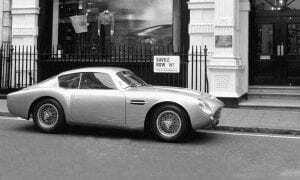 The story of Aston Martin’s first dalliance with Zagato should start with the first DB4 which was unveiled at the Paris Motorshow in 1958. Designed by Carrozeria Touring of Milan, every major component was new. It employed the Superleggera (super-light) system by using alloy body panels affixed to a tubular frame, and its new 3.7-litre straight-six, dohc engine produced 240bhp. Capable of 140mph, the 2+2 DB4 remained in production until June ’63, by which time there had been five distinct series and a total of 1,110 had been built. Priced at £3,980 in 1958, a good DB4 now fetches anything from £400k to £575k. Premiered at the 1959 London Motorshow, the 2-seater DB4 GT featured lighter-gauge aluminium panels, a 5-inch shorter wheelbase, a 12-plug cylinder head and 302bhp. It also had a few styling cues, eg. the faired-in headlamps, which were to feature on the later DB5. With more power and being 84kgs lighter, the 4 GT’s performance was impressive – 0-60 in 6.1 secs and a 153mph top speed. Costing £4,534, a total of 75 DB4 GTs were built until production ceased in 1963 and current values range from around £2.3 to £2.7 million. Built to challenge Ferrari in the World Sportscar Championship, the Zagato version was first revealed at the 1960 London Motorshow. 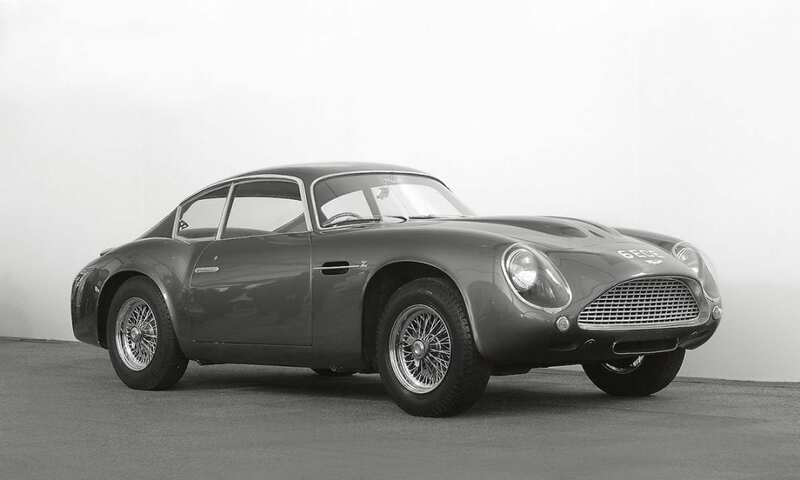 DB4 GT chassis were dispatched from Newport Pagnell to Milan for fitment of the 45kg-lighter Zagato aluminium body. With a higher compression ratio power was raised to 314bhp, although despite the slippery lightweight body and extra power, straight line speed was little improved. Although raced by the likes of Stirling Moss and Jim Clark, success on the track proved elusive as the Zagato was something of a handful when driven at ten tenths. Crashes and mechanical woes also dogged the car in major races, although one did score a prestigious victory at the British GP meeting in 1961. In late 2015 the hammer fell on a ’62 Zagato at £9.45 million, thus making it the most expensive British car ever sold at auction, (until surpassed a year later by a Le Mans-winning 1955 Jaguar D-Type). The Zagato’s rarity and desirability means current estimates are around the £10 to £12 million mark. By the way, if you’re planning on attending the London Classic Car Show (February 23-26, 2017), we’ll be featuring an Aston Martin DB4 Zagato on our stand, where we’d be delighted to show you the car. In 1988 four DB4 chassis with previously unused chassis numbers were modified to GT spec and then dispatched to Zagato in Italy to be clothed in Zagato bodies. These ‘works approved’ Sanction II cars were also lightly modified for improved handling and were fitted with 352bhp, 4.2-litre engines. A further two (Sanction IIIs) were completed in 2000. It’s hard to say much about the 250 GTO without an elephant very soon entering the room, that elephant being; what’s it worth? Since 1990 when it surpassed the value of the previous record holder – a Bugatti Royale, the 250 GTO has generally been acknowledged as the world’s most expensive car. Bonhams sold one at auction in 2014 for £30 million, and current estimates are in the region of £40 million, give or take a bit for racing provenance and originality. Indeed, last October when Ascot Ferrari specialist Talacrest advertised the second of the 36 GTOs built at ‘£POA’, the press revealed that its asking price was £45 million. It’s unlikely that any other car will come out of the woodwork, or a manufacturer-owned collection, commanding a higher price (other than possibly another GTO), but if you’re interested it’s still for sale. So, with the elephant out of the way, why the big deal? The 250 GTO was designed and built as a sports-racer, although like pretty much all other enclosed-wheel racers of the day, it was road legal from the factory and easily registered for road use. It was effectively the ultimate development of the line of 250 and 250 GT road models that had been in production from 1952 and 1955 respectively. 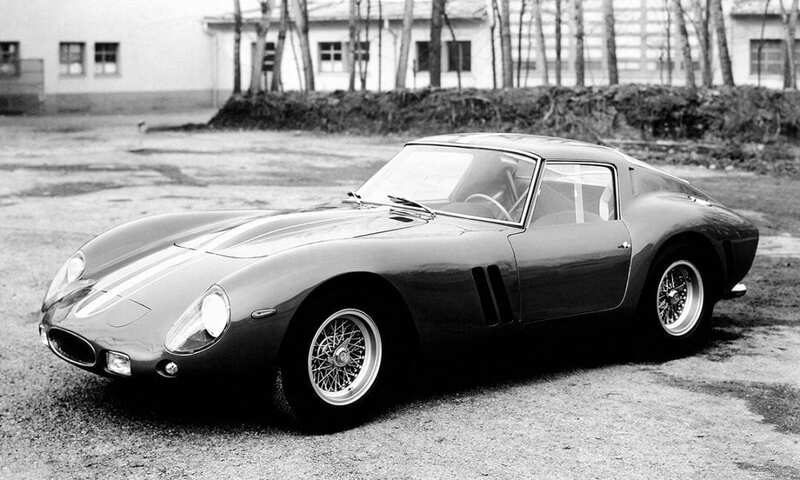 The ‘O’ in GTO stood for ‘Omologato’ and at least 100 should’ve been produced to comply with the FIA’s racing regulations, but Ferrari fell well short of that figure initially arguing that its GTO was a merely a development of the existing 250 GT. True, the GTO was powered by essentially the same 2,953cc V12 as the 250 GT, but with 300bhp it was more powerful and the GTO sported a completely new and totally restyled Scaglietti-built body. Legend has it that while the FIA inspectors were at Maranello to verify the numbers, Enzo Ferrari had the few GTOs built shuffled about to different places in the factory while the FIA chaps were elsewhere being force fed another espresso. This, combined with deliberately out-of-sequence chassis numbers was sufficiently confusing and it did the trick, although Enzo’s subterfuge subsequently backfired when the time came to have the later 250 LM homologated, but that’s another story. Anyway, compete the GTO did, and success came in abundance with the car winning the over 2-litre FIA GT Manufacturers Championship in 1962, ’63 and ’64, while major race victories included the RAC Tourist Trophy in ’62 and ’63, the Spa 6hr in ’63 and ’64 with wins at Daytona also in ’63 and ’64. In the Le Mans 24hr GTOs finished 2nd, 3rd and 6th overall in ’62, 2nd, 4th and 6th in ’63 and 5h and 6th in ’64. Ferraris have never been cheap and the 250 GTO was no exception – £6,600 would buy about eleven 4-door Deluxe Ford Cortinas in late 1962. While that may seem cheap compared with today’s LaFerrari – its list price would buy over 50 Mondeos – you couldn’t take a LaFerrari to 2nd overall at Le Mans, drive to Paris that evening for a night on the town and then back home to Belgium the following day, as was Ecurie Belge’s GTO in 1963, so it was money well spent, at least for some. No two GTOs were identical and three or four, aka ‘330 Le Mans Berlinettas’, were built in ’63 with 4-litre engines and bodywork that resembled the 250 Lusso. Additionally, three ‘Series II’ GTOs were built in ’64 with 250 LM-style bodies, while four earlier GTOs had LM-style bodies retrofitted in period at the factory. 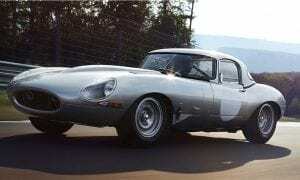 Jaguar’s E-Type caused an absolute sensation when it was launched at the Geneva show in early 1961. At the time there were a very few other cars that were almost, but not as fast as the near-150mph E-Type, but none were described by Enzo Ferrari as “the most beautiful car ever made”, and all were two to three times the price of the £1,550 Jaguar. The Coventry firm took 500 orders at Geneva, while at Jaguar’s main London showroom on Piccadilly, a customer requested a test drive and was informed that all the demonstrator cars were in Switzerland. He replied, “Put through a phone call will you? If you’ll reserve me a trial for tomorrow, I’ll fly out”. The E-Type was loosely based on the highly successful D-Type racer and contributing toward the E-Type’s affordability was that under the long, sleek bonnet was the latest development of the in-line six that had powered all Jaguar’s sports cars since the XK120 of 1948. An old 4-speed gearbox with a slow gearchange notwithstanding, the 3.8-litre 265bhp E-type could rattle off 0-60mph in 6.5 secs, 0-100 in 16.2 and it had the chassis, suspension and handling to match. It wasn’t long before E-Types took to the track. In April ‘61 Graham Hill drove an E-Type to victory in the 25-lap GT Trophy Race at Oulton Park. An impressive achievement, but especially remarkable considering that this was the E-Type’s racing début, and the winning car had only been collected from the factory the previous day! Although Jaguar had officially withdrawn from competition in 1956, the firm committed itself to the ongoing tuning, lightening and preparation of the top privately-entered E-Types. Although still competitive, 1962 was a patchy year, and Jaguar became concerned enough to design a proper competition version. 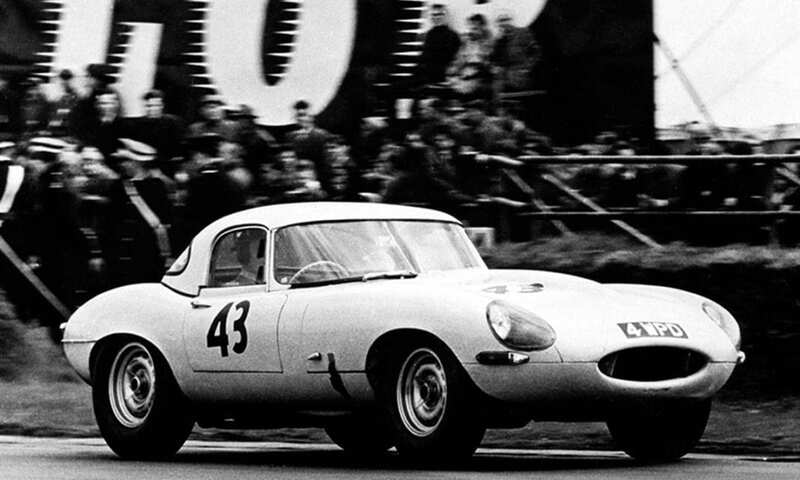 The Lightweight E-Type was born the following year. In place of steel, the Lightweight had an all aluminium body and monocoque chassis, although the front subframe remained in steel. The dry-sump engine block was aluminium too, topped with an aluminium, wide-angle D-Type cylinder head. Additionally, carburettors were replaced by a Lucas fuel injection system, alloy wheels replaced steel wires and later examples were fitted with a close-ratio 5-speed gearbox. All in all, the standard steel E-Type’s weight was down by 114kgs, power was up to 344bhp and Jaguar was competitive again, especially on British circuits and when driven by a young Jackie Stewart. However, overseas the Lightweights rarely matched the pace of their quickest rivals. Jaguar had initially planned to build 18 Lightweights, but just 12 were delivered, all fixed-head roadsters, plus a couple of ‘Low-Drag’ coupes. 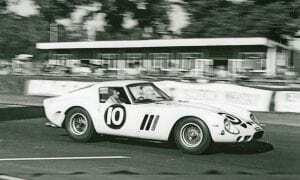 The first of these coupes was a semi lightweight prototype built in ’62, the latter a full Lightweight and one that had the legs on all the Ferrari GTOs in the ’63 Le Mans 24hr, until it broke. How so few Lightweights were homologated for competition is a moot point. Years later Motor Sport magazine reported that it was achieved by a “neat fiddle” on Jaguar’s part, while other sources claim it was due to an act of great generosity by the sport’s officialdom. So, probably a bit of both. 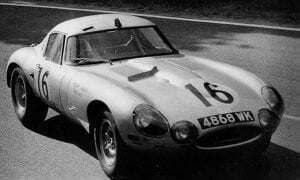 In 1963 a Lightweight cost from £1,500 to £1,850 more than a standard E-Type, so, at around £4,000, it was about double the price. Estimate today? Around £5m to £5.5m. Stop press; make that £6 million! 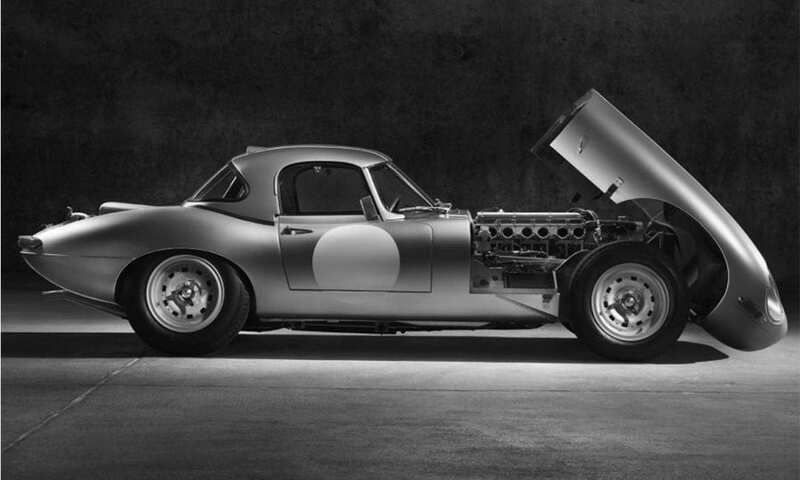 Using the chassis numbers that were earmarked for the six unbuilt cars, in May 2014 Jaguar’s Heritage division announced that it was to build six £1.2m Lightweight E-Type ‘continuations’. All would be near perfect hand-built reproductions to the exact specifications of the original 12 cars and certified by the FIA for historic racing but with more modern brakes for safety and with bespoke requests catered for. Had this blog been entitled ‘Classic Quartet of the 1960s’ then we’d likely have included the Ford GT40 Mk. III – a mid-engined V8-powered road-only version of the Ferrari-beating, Le Mans-winning GT40 Mk. II racer with an extended rear end for luggage. Just seven Mk. IIIs were built in 1966-7. But that would have demanded the inclusion of exquisite Lamborghini Miura (1966-73), not to mention the Shelby Daytona Coupe (1964-65) which, like our Aston/Ferrari/Jag trinity, was another low-volume road/racer built specifically to beat Ferrari’s 250 GTO. We’re passionate about classic cars at JBR Capital and we can quickly build a bespoke finance package to suit your needs. So if you’re interested in acquiring the car of your dreams from any decade then please call one of our experts today on 020 3355 0035 to explore your finance options.